Lower frame constructed from 304 stainless steel with continuous TIG welds. 304 stainless steel product contact surfaces with an electro-polished finish. 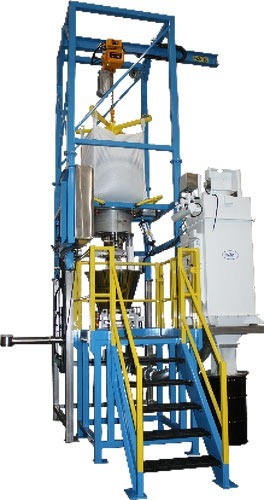 Flo-Master™ bag massaging system with tubular frames promotes material flow. Flo-Lock™ pneumatic discharge spout closure system provides reliable product flow shut off for partial bag discharging. Seal-Master™ spout access chamber with gull wing doors for easy operator access. Twin tube product discharge transition with sloped outer take-off cowl. Gravimetric feeder delivers pigment powders at rates up to 2,200#/hour. Integrated carbon steel dust collection system with collection drum. Flo-Lock™ pneumatic discharge gate provides reliable product shut off for partial bag discharging. 304 stainless steel pneumatic fittings and tubing. PVC coated conduit, NEMA 4X enclosures.